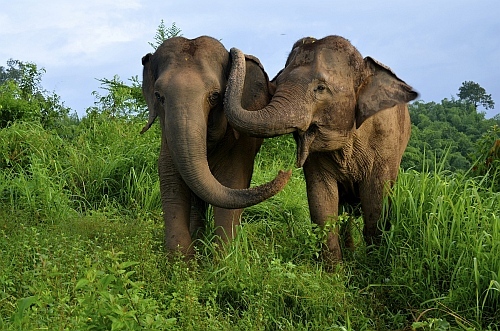 Today, we are pleased to publish “Asian elephants (Elephas maximus) reassure others in distress”, and we invited Dr. Joshua Plotnik, first author on the paper, to comment on his research. 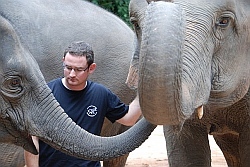 Joshua Plotnik is founder and CEO of Think Elephants International, a non-profit based in New York, currently working in Thailand on integrating the study of elephant behavior with conservation education. He is also a lecturer in conservation biology at Mahidol University in Thailand, and a researcher in the Dept of Psychology at the University of Cambridge in England. Josh graduated with a B.S. in Animal Science from Cornell University before moving to work with Frans de Waal at Emory University for his M.A. and Ph.D., which he received in Psychology in 2010. Josh began studying elephants at the Bronx Zoo in New York in 2005, and has been studying elephants in Thailand since 2007. His work on elephant intelligence, which has included projects on mirror self-recognition, cooperation and sensory perception, has been featured in hundreds of media outlets around the world, including the BBC, ABC NEWS, the New York Times, the Washington Post, National Geographic and the Associated Press. You can learn more about Think Elephants’ work at www.thinkelephants.org. PJ: Can you tell us a bit about the research you publish today? JP: How animals resolve conflicts is an exciting area of research, and has been expanding ever since the first studies on it in chimpanzees by Frans de Waal and colleagues in the late 1970s. Usually, scientists study two forms of conflict resolution: reconciliation (which looks at how aggressors and victims “make up” after fights) and consolation (which looks at how uninvolved bystanders reassure the victims). Interestingly, reconciliation is relatively common in the animal kingdom, while consolation is relatively rare. One hypothesis suggests the reason for this is that consolation has empathic underpinnings unique to only a few species in the animal kingdom. To date, only the great apes, canines and corvids have shown consolation. Elephants make an interesting and unique test subject because they are well-known for their intelligence and social complexity (as well as acts of helping behavior and empathy), but much of the evidence for these capacities is anecdotal. We observed how elephants interacted with others in distress at an elephant camp in Thailand. We found that elephants adopted the emotional state of, touched and called out to those in distress, and did so in ways that seemed to mirror the consolatory behavior we see in other species. Elephants often rumbled or chirped toward those in distress, and reached out to touch the distressed individual’s mouth and face. If a distressed elephant put their ears out and straightened their tail, the bystanders often did the same. When you see a friend crying, you will often go toward them and put your arm around them. Your facial expressions change, and your feelings turn to sadness. Chimpanzees often embrace or hug victims of fights, and touch each other’s faces for reassurance. To our knowledge, this is the first study of consolatory behavior in elephants, and suggests that the complexity of elephant social behavior may be on a par with that of the great apes. PJ: What kinds of lessons do you hope the public takes away from your findings? JP: Humans are a remarkable species, with remarkable intelligence. But humans are most certainly not alone in their ability to feel and think. The differences are mainly in degree, and the work of scientists that study comparative cognition is to find out how to measure these degrees of intelligence. The more we learn about non-human animal intelligence, the more we learn about our own. In addition, I hope that with a greater understanding of animal behavior and intelligence comes a greater appreciation for the need for conservation. Elephants are one of those majestic species that every child admires and every adult remembers. But we are losing them at such an alarming rate that it is possible the next generation will be without them in the wild. Teaching young people about elephant behavior not only enables them to think critically about problems facing elephants in the wild, but also to relate to them as intelligent beings. PJ: What challenges did you face while doing this research? JP: While the loss of wild elephants to poaching is one of the biggest problems in conservation today, the welfare of captive elephants is also a huge issue both in the West and range countries. It has been difficult to navigate all of these issues, but research into elephant behavior has important implications for managing captive and wild elephant populations. If we don’t understand elephant behavior, we can’t come up with viable solutions for protecting them in the wild and providing for them in captivity. Conducting research on captive elephants, especially observational studies, is difficult because these elephants often have different stressors and different social dynamics. But the purpose of this study was to investigate the capacity for elephant consolatory behavior by focusing on a population that was most likely to exhibit it. You would expect that even if the social situations of captive elephants differ from those of elephants in the wild, the expression of consolation would be similar. Hopefully, future research on consolation in wild elephants will confirm our results here. PJ: What is next in your research? JP: I plan to expand our research on cognition in elephants, but focus more on empirical studies that specifically allow us to look at how elephants “think” about their physical and social environments through controlled experiments. I am currently working with a population of 26 elephants in Chiang Rai, Thailand, and recently built a research facility there that will allow us to safely conduct behavioral studies with the elephants. PJ: How did you first hear about PeerJ, and what persuaded you to submit to us? JP: I read about PeerJ on a blog, and contacted several colleagues who had published with you. They spoke very positively about the process and experience. In addition, our work has a strong conservation component, and we work hard to integrate our research into conservation education programs. Because children in range countries do not have access to paid journal subscriptions, we are trying to get some of our work in open-access journals where anyone can access the research. The combination of PeerJ’s growing reputation and their open-access structure was thus really appealing for us. PJ: How would you describe your overall experience with us, in terms of submission, review, and production? JP: It was a breeze – from submission to review, I was very pleased with the experience. The submission website is user-friendly and easy to navigate. I have been especially impressed with my communications with senior PeerJ staff. Easy and fast communication with Dr. Peter Binfield (the publisher) and his staff has been a real plus. PJ: What do you think about our “Pay once, Publish for life” publishing plans? JP: You can’t really complain about paying $99 to publish once a year for the rest of your life. For animal behavior researchers, publishing in open access journals is often cost prohibitive if you don’t get a fee waiver. This model makes it easier for scientists in any field, regardless of their funding capabilities, to publish open-access. PJ: Anything else you would like to talk about? JP: I am most excited about publishing in open-access journals because it gives the general public greater (and easier) opportunities to learn about how scientists do science. This, in turn, allows for greater public engagement in science and hopefully greater understanding of and appreciation for research. I believe this is especially true for the fields of animal behavior and conservation. JP: Fast, efficient and satisfying. PJ: Many thanks for your time! Experience the PeerJ process for yourself, and take advantage of our free publication offer (when you also submit a preprint) through the last day of March.